Piano Music The Banjo Picker. This is sheet music by John Thompson's Students Series for the piano. 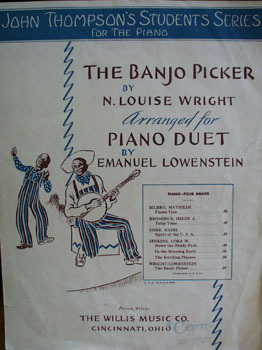 Titled The Banjo Picker by N. Louise Wright arranged for Piano Duet by Emanuel Lowenstein. Published by The Willis Music Co of Cincinnati, Ohio. Total of 6 pages. The back page has a nice article about John Thompson. In excellent condition. Measures 9"" wide by 12"" high. Items Similar To "Piano Music The Banjo Picker"